After a couple of weeks of switching between the HTC Sensation 4G and HTC MyTouch 4G Slide, it’s time to look at these two phones in an in depth review and comparison, I am going to throw these two phones into the octagon (because let’s face it, boxing is dead) and watch these two duke it out mono y mono in a 10 round super smackdown. Welcome to the UPhC – the Ultimate Phone Championship. As the first bell rings, the two phones enter the ring and immediately begin a walkoff to show off their external design. First to flex its muscles is the the MyTouch 4G Slide with its sleek edges and smooth surface. As it continues to flex its muscles, it slides out its keyboard to show off its extra capabilities. But the added keyboard comes comes at a cost in the form of weight, tipping the scales at 6.5 oz vs. the Sensation at 5.9 oz. Not intimidated at all is the HTC Sensation 4G as it shows off its own beautiful rounded edges and grip friendly surface that feels solid in the hand. This round goes to the HTC Sensation when it lifts its back cover to reveal a Darth Vader-like inside. 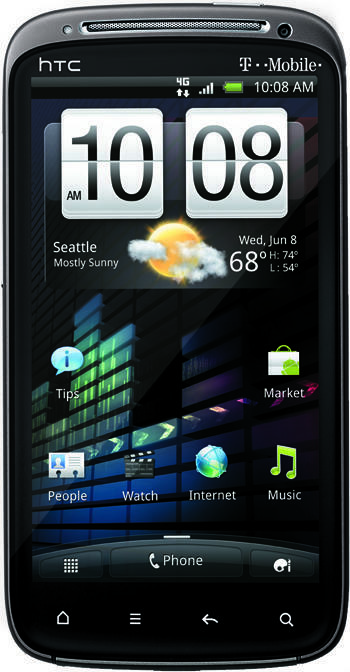 The HTC Sensation just looks and feels more imposing and solidly built. The second round begins with both phones trying to flash each other to stun the other into submission. The audience groans in disgust. Both phones feature the latest and greatest Qualcomm 8260 Dual Core Snapdragon 1.2 GHz Processors. They also both have 768 MB of RAM and 4GB of internal storage. The MyTouch 4G has an 8GB class 4 micro SD card while the Sensation only comes with a 1GB SD card. By a very, very slight margin, this round goes to the MyTouch 4G. At the start of the third round, both phones start screaming at each other to intimidate one another. After numerous calls on both phones, call quality was generally excellent no matter which one I was using. There were very few dropped calls except in known dead zones and both phones did a so-so job of handing off from a 4G network to a 3G or 2G network. 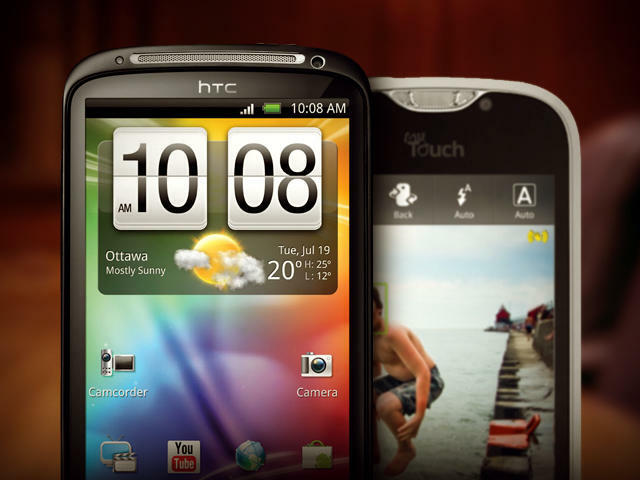 Both phones had excellent and loud speakerphones that were made more convenient with the new HTC Sense 3.0. This round is a draw. This round is full of grappling with both phones getting down and dirty on the floor. The HTC Sensation struggles in this round as its HTC Trace keyboard mysteriously omits several very common words. The Sensation’s phone app is also difficult to use and is just too busy with the contact list and recent calls all in the background. The MyTouch’s slide out physical keyboard, Swype interface and improved and easy to use phone app make this an easy round for the MyTouch 4G. Other features on the MyTouch 4G include the Genius button as well as the quick launch bar that stays on every screen. The Sensation’s only saving grace is the fact that it has 7 customizable home screens and the quicklaunch lock screen. The Sensation nearly loses the fight with devastating rear naked choke by the MyTouch’s simplicity. The Sensation is saved by the bell. This round has a strange start as both phones start using their camera flashes to blind their opponents. But alas, the Sensation is again torn apart by the MyTouch 4G, as its camera doesn’t come close to matching up to that of the latter. All it has in common is the 8 megapixels and after that it is all the MyTouch 4G pummelling the Sensation with it’s superior camera software, featuring SweepShot Panorama, HDR, Multiple BurstShot, Portrait Mode, Effects, Night, Action, Macro and Manual modes. 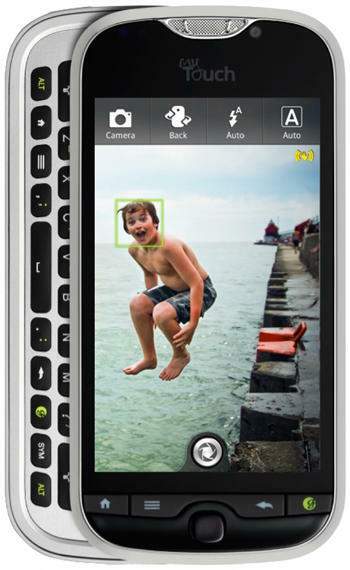 The low profile dedicated camera button allowing for instant shots completed the MyTouch’s dominance in this round. The Sensation came out in this round ready to fight, and fight it did with a huge comeback effort. The Sensation’s 4.3-inch qHD display shines in comparison to the much lesser MyTouch’s 3.7-inch WVGA screen. The qHD screen is both brighter and crisper, and it is easy to see why the Sensation is T-Mobile’s Flagship phone. Games and pictures look brilliant on the qHD screen and you have to wonder why HTC went with the much lesser WVGA screen for a phone they were boasting would have the best camera on the market. This was a very balanced round as both phones came out ready to fight. Unfortunately they basically have the exact same software setups. Both rock Android 2.3 Gingerbread software and both have HTC Sense 3.0 skin. There are a few difference that affect UI but that was already addressed in an earlier round. This round is a draw with both phones taking some heavy punches. You can tell that both phones hit the speed bag often as both their punches come fast and accurate. Again, due to their very similar architecture, the Qualcomm Snapdragon processors on 4G networks both phones clipped along at super fast speeds. Web pages hardly ever needed any time to load and even doing side by side comparisons of the same web page, both phones pretty much rendered the sites at the exact same time. I was expecting the Sensation to come in a bit slower due to the fact that it had more pixels to load, but every single time it kept up with the MyTouch. Another draw. It is late in the fight and both phones are losing juice. Neither phone can seem to hold their antennae up. This has been a brutal fight, but they still won’t give up. Both phones have identical batteries at 1520 mAh and both of theme severely disappointed in terms of getting through the day without any additional charge. Each phone generally gave no more than eight hours of all-purpose use. General purpose meaning about two hours of talk time and an hour or so of Internet use ,and the rest on standby with everything including Bluetooth on. You can probably squeeze more out of these phones if you turned a few things off and were diligent about killing apps, but I was trying to give them as rigorous a test as possible. Basically, battery life is not keeping up with the latest cell phone technology and this may be a limiting factor for future innovation. This round is another draw. Ladies and gentlemen, we finally come to the last round. Please give both phones a big round of applause! Let’s take a quick look at the intangibles, meaning the features that you can’t really categorize in any of the above rounds. The Sensation is truly a well made and beautiful specimen of a phone. There are few phones on the market that will truly rival it in terms of speed, usability and design; it is truly that jack of all trades and does everything well. On the other hand, the MyTouch 4G does not disappoint and excels in what are touted as its key features. The camera is truly a great substitute for your average point and shoot camera and this phone signals the beginning of the end for those kinds of devices. Also the simplicity of this phones user interface allows even my tech-phobic grandmother access to the latest and greatest features of 4G and Android. This round is another tie for the Sensation’s versatility and MyTouch 4G’s simplicity. And the winner by split decision… The HTC MyTouch 4G Slide. This fight was incredibly close, and both phones are winners in my book. The Sensation definitely put up a great fight, but the MyTouch 4G Slide won a few early rounds. If you are currently on T-Mobile and you need a phone right now, you won’t be disappointed with either of these handsets. Pick the Sensation if you want the best phone and don’t care about either a slide out keyboard or camera quality. Pick the MyTouch 4G Slide if you want to consolidate your point and soot camera and phone into one device or if you have fat fingers and can figure out the new Swype type technologies. What do you guys think guys? Do you have either of these phones and are you happy with them?